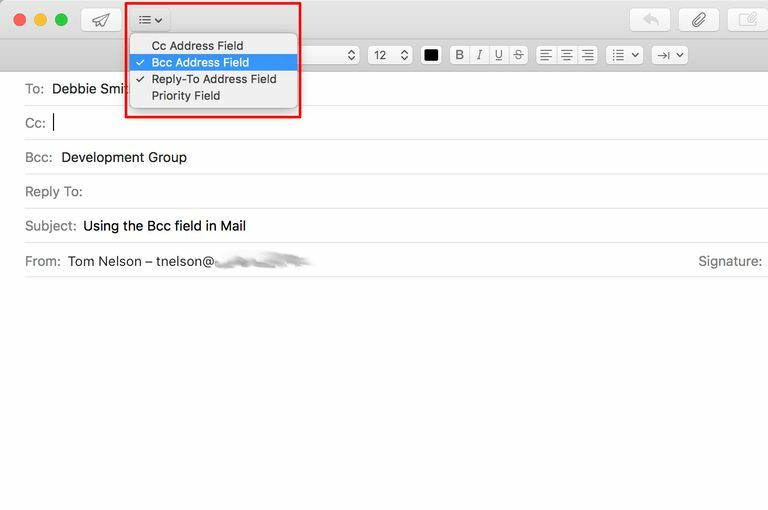 To enable the BCC option in Mail, click the visible header fields and select BCC Address Field. When you send an email message to a group of colleagues, privacy isn't usually much of an issue. You all work together, so you know each other's email addresses, and you mostly know what's going on around the office, at least in terms of projects and news. But when you send an email message to almost any other group, privacy may indeed be a concern. The recipients of your message may not appreciate having their email address revealed to a number of people they may not even know. The courteous thing to do is to use the BCC (blind carbon copy) option to send your message. When the BCC option is enabled, it shows up as an additional field where you can enter recipients' email addresses. Unlike the similar CC (Carbon Copy) field, email addresses entered into the BCC field remain hidden from other recipients of the same email. BCC seems like a good way to send emails to a group of people without letting everyone know who is on the list. But this can backfire when a person who received a BCC email chooses to Reply to All. When this occurs, all email recipients on the To list and CC list will receive the new reply, inadvertently letting others know that there must have been a BCC list as well as the public list of recipients. Aside from the person on the BCC list who chose the Reply to All option, no other member of the BCC list is exposed. The point being, the BCC is an easy way to hide a recipient list, but like most easy ways of doing things, it has the potential to be easily undone. The process of enabling the BCC field varies slightly, depending on the version of OS X you're using. Launch Mail by clicking its icon in the Dock, or selecting Mail from the /Application folder. In the Mail apps window open a new message window by clicking the Compose New Mail icon in Mail’s toolbar. Click the visible header fields icon to the left of the From field, and select BCC Address Field from the pop-up menu. Enter the email addresses of the target recipients in the BCC field, which will now be displayed in the new message form. If you want to put an address in the To field, you can enter your own email address. The BCC field will be enabled in all future email messages, in all of your Mail accounts (if you have multiple accounts). To turn off the BCC address field, click the pop-up menu to the left of the From field and select BCC Address Field. This will remove the check mark next to the menu item. The process for enabling and using the BCC field is nearly identical to the method listed above. The only difference is where the visible headers field button is located. In older versions of Mail, the button was located to the left of the From field in the new message window. In OS X Yosemite and later, the visible headers button has been moved to the toolbar at the top left of the new message window. Except for the new location of the button, the process for enabling, disabling, and using the BCC field remains the same. Using the High Priority or Low Priority setting will result in an entry in the priority column of the Mail app. Selecting Normal Priority produces no entry in Mails priority column just like before you made the priority field visible. It's too bad you can't customize the priority choices, which could be helpful for inter-departmental emails. On the other hand, it would just as likely lead to some very creative priority levels. I leave it to the reader to imagine what they may be.